Background and objectives Delayed graft function is a form of AKI resulting from ischemia-reperfusion injury. Our aim was to study the effect of delayed graft function on the progression of interstitial fibrosis after deceased donor kidney transplantation. Design, setting, participants, & measurements Our study is a retrospective study of all patients transplanted at our center between July of 2003 and September of 2014 using a kidney from a deceased donor. The primary outcome was the progression of interstitial fibrosis on serial protocol biopsies done during the first year post-transplant. We analyzed the distribution of the change in the Banff interstitial fibrosis (ci) score between the delayed graft function and nondelayed graft function groups for all of the paired biopsies done at time 0 and 12 months post-transplant (Δfibrosis). We also performed a linear mixed model analyzing the difference in the slopes for the progression of mean Banff ci score for all of the biopsies done at time 0 and 1, 4, and 12 months post-transplant. Results There were 343 (36.7%) in the delayed graft function group and 591 in the control group. The biopsy rates for the delayed graft function and nondelayed graft function groups at time 0 were 65.3% (n=224) and 67.0% (n=396), respectively, and at 12 months, they were 64.4% (n=221) and 68.4% (n=404), respectively. Paired biopsies were available for 155 in the delayed graft function group and 283 in the control group. In a risk-adjusted model, Banff ci score >0 on the time 0 biopsy had a higher odds of delayed graft function (odds ratio, 1.70; 95% confidence interval, 1.03 to 2.82). The distribution of the Δfibrosis between 0 and 12 months was similar in delayed graft function and control groups (P=0.91). The slopes representing the progression of fibrosis were also similar between the groups (P=0.66). Conclusions Donor-derived fibrosis may increase the odds of delayed graft function; however, delayed graft function does not seem to increase the progression of fibrosis during the first year after transplantation. Studies of ischemia-reperfusion injury (IRI) document perturbations in a number of pathways that could result in cell death, inflammation, and fibrosis. Animal models have provided evidence for a number of potential molecular mechanisms that result in cell injury and fibrosis (1–7). Cytokines and chemokines produced by tubular epithelial cells as well as infiltrating cells are involved in IRI (1,3). The innate immune system, including the complement and coagulation cascades, are also upregulated (7–9). IRI can have possible effects on the adaptive immune response, resulting in increased allorecognition (10,11). Although these models have provided evidence that graft fibrosis may result from the response initiated by IRI (8), no study has systematically tested this hypothesis. Transplant offers the unique vantage to follow serial histologic changes post-IRI. The IRI that occurs with deceased donor kidney transplantation is associated with delayed graft function (DGF) in at least 25% of patients (12), and the frequency of DGF seems to be increasing (13). Risk factors include cold ischemia time (CIT), donor age, previous failed transplant, donor terminal creatinine, recipient obesity, recipient dialysis status, donation after cardiac death (DCD), and donor cause of death (12,14–17). Although some studies show that DGF is associated with a higher risk of graft loss (18–20), others have not shown this (16,21). Some studies have also suggested that DGF is associated with a higher risk of rejection (16,18,22). However, there are no studies that have analyzed the effect of DGF on progression of allograft fibrosis. Our aim was to study the effect of DGF (as a marker of IRI) on the progression of interstitial fibrosis during the first post–transplant year after deceased donor kidney transplantation. To study this, we performed two separate analyses: (1) we analyzed the change in fibrosis on paired biopsies between reperfusion and 12 months post-transplantation, and (2) then, we used a mixed linear analysis of all biopsies done at time 0 and 1, 4, and 12 months post-transplant to assess whether progression of fibrosis is accelerated by DGF during the first year after transplantation. This is a retrospective study of all patients who received a solitary deceased donor kidney transplant at our center between July of 2003 and September of 2014. Follow-up was complete through September of 2015. We excluded recipients who received a simultaneous extrarenal transplant. We excluded 16 recipients who lost the allograft during the first 30 days post-transplant (1.7%). We defined a patient with DGF as any patient who required dialysis during the first 7 days after kidney transplantation. This study was approved by the Mayo Clinic Institutional Review Board. This was a retrospective study and considered low risk; therefore, patient informed consent was not required. The clinical and research activities being reported are consistent with the Principles of the Declaration of Istanbul as outlined in the Declaration of Istanbul on Organ Trafficking and Transplant Tourism. All patients received induction immunosuppression. Before 2011, patients received induction with rabbit antithymocyte globulin. After 2011, induction was with alemtuzumab. Patients over age 65 years old received basiliximab, which did not change during the study period. Patients receiving induction with the depleting agents had complete withdrawal of corticosteroids by post-transplant day 5, whereas those receiving basiliximab induction continued maintenance corticosteroids. Maintenance immunosuppression was typically with tacrolimus and mycophenolate mofetil. Tacrolimus was started on post-transplant day 1 or 2, irrespective of DGF. Goals for trough tacrolimus levels were 8–10 ng/ml for the first month and then, 6–8 ng/ml. At our center, we discharge patients on day 3, irrespective of DGF, and monitor them closely in the outpatient setting. Patients with ongoing DGF will have a repeat Doppler ultrasound and biopsy of the allograft at about 2 weeks post-transplant. GFR was estimated using the Chronic Kidney Disease Epidemiology Collaboration equation (23). Our clinical protocol includes postreperfusion biopsy for deceased donors (time 0 biopsy). Our clinical protocol also includes surveillance biopsies at 1, 4, and 12 months after kidney transplantation. The renal allograft light microscopy protocol includes hematoxylin and eosin, periodic acid–Schiff, trichrome, and silver stains, with levels on each. All biopsies were examined prospectively by a subset of pathologists who routinely review renal allograft biopsies. Banff 2007 criteria were used to quantify acute and chronic histologic findings (24). Univariate and multivariate logistic regressions were used to explore the risk factors for DGF and the relationship between DGF and moderate to severe graft fibrosis (Banff ci >1) at 12 months. We used the Kaplan–Meier method to analyze graft survival (including death with functioning graft) and the cumulative rate of rejection during the first post–transplant year between the groups. Statistical significance required a two–sided P value <0.05. To determine the effect of DGF on the progression of fibrosis, we performed two separate analyses. We analyzed the distribution of the change in the Banff interstitial fibrosis (ci) score (ordinal; categorical 0–3) between the DGF and non-DGF groups for all of the paired biopsies done at time 0 and 12 months post-transplant (Δfibrosis). We also performed a linear mixed model analyzing the difference in the slopes for the progression of fibrosis (mean of the Banff ci scores as the continuous variable at each time point) for all of the biopsies done at time 0 and 1, 4, and 12 months post-transplant. Statistical analysis was done using JMP Pro 10.0.0 (JMP Statistical Discovery, Cary, NC) and SAS 9.4 (SAS Institute Inc., Cary, NC). There were 934 consecutive patients who met criteria for analysis included in the study cohort: 343 (36.7%) in the DGF group and 591 in the control group without DGF (because our center accepts high-risk donors, we have a high rate of DGF). The mean±SD recipient age was 55.7±12.8 years old, and this was not different between the groups. 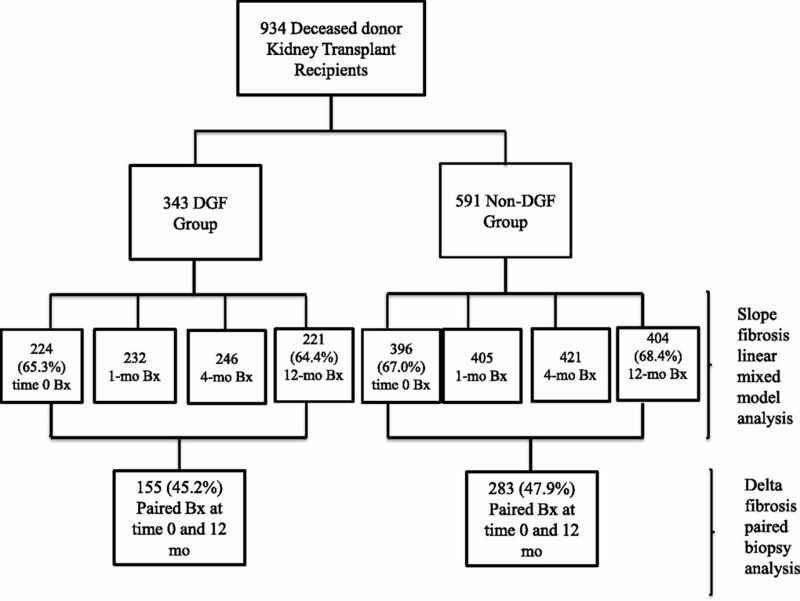 The DGF group members were more likely to be men, diabetic pretransplant, and on dialysis before transplantation (Table 1). The median (25%–75% range) number of days of DGF was 9 (4–15) days for this group. The median follow-up was 2.71 years for the DGF group and 4.08 years for the control group (P<0.001). There were several differences in the donor characteristics between the groups (Table 1). For the DGF group, the donor was more likely to be a man, follow DCD, have a higher terminal creatinine, and have longer CIT. 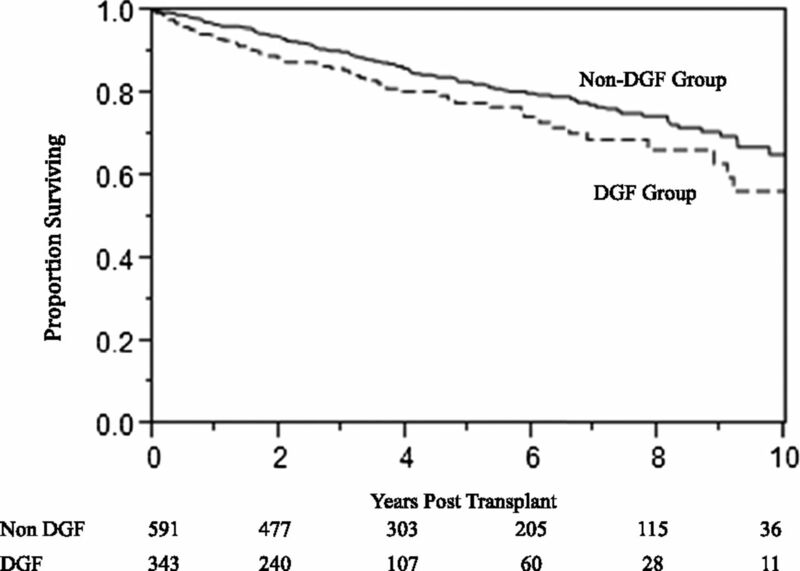 In addition, DGF was more common in the cohort transplanted after 2011. All patients received induction therapy. Induction agent utilization included basiliximab, rabbit antithymocyte globulin, or alemtuzumab. As a result of a change in clinical protocol in 2011, there was a higher utilization of alemtuzumab in the DGF group (Supplemental Table 1). The fraction of patients treated with rapid corticosteroid withdrawal was not different. Tacrolimus levels were lower in the DGF group at 1 week post-transplant, but there were no significant differences in tacrolimus levels at any of the other time points during the first post–transplant year. We performed a logistic regression analysis of the baseline factors for a possible association with DGF (Table 2). In this analysis, Banff ci score >0 on the reperfusion biopsy was associated with increased odds for DGF in the risk-adjusted model (odds ratio [OR], 1.70; 95% confidence interval [95% CI], 1.03 to 2.82). Graft survival, including death with a functioning graft, was lower in the DGF group (log rank P value =0.02) (Figure 1). Estimated 3-year graft survival was 85.7% in the DGF group and 90.3% in the control group. This difference was entirely accounted for by differences in survival in the cohort transplanted before 2012 (log rank P=0.01), whereas in the later cohort, survival was not different between the groups (P=0.48) (Supplemental Table 2). Graft survival including death with a functioning graft. Graft survival was lower in the delayed graft function (DGF) group (log rank P value =0.03). The estimate for graft survival at 3 years was 85.7% in the DGF group and 90.3% in the control group. The numbers of patients at risk for each group at each time point are shown at the bottom. The eGFRs (mean±SD) at 12 months were 56.9±20.1 ml/min per 1.73 m2 in the DGF group and 59.9±21.3 ml/min per 1.73 m2 in the control group (P=0.07). The cumulative rejection rates at 12 months were 16.9% in the DGF group and 17.2% in the control group (log rank P=0.97). The rates of BK viremia and BK nephropathy were 10.2% and 4.4% in the DGF group, respectively, and they were slightly lower than in the non-DGF group: 14.9% and 6.1%, respectively (P=0.05). Reperfusion biopsies (time 0) were available in 224 (65.3%) in the DGF group and 396 (67.0%) in the control group (P=0.60) (Figure 2, Supplemental Table 3). 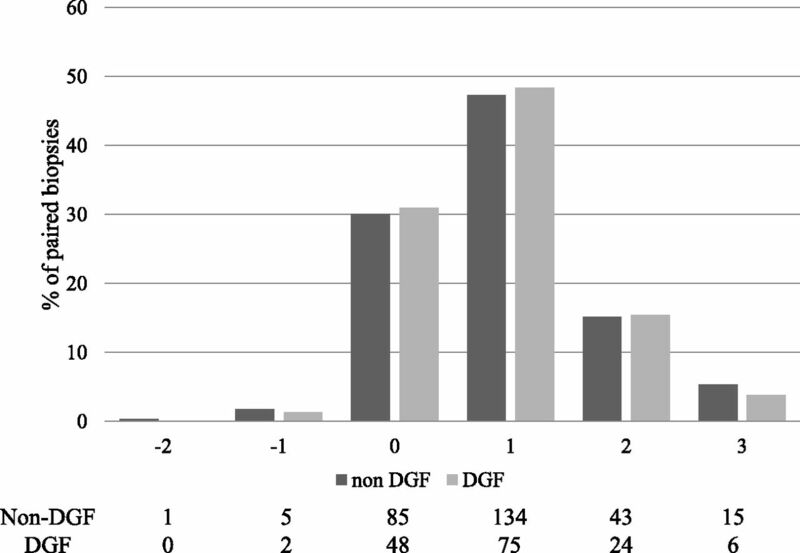 The fractions of biopsies with Banff ci >0 were 23.7% the DGF group and 19.7% in the control group (P=0.25). The fraction of reperfusion biopsies with arteriolar hyalinosis (Banff arteriolar hyaline thickening >0) was not different between the groups (15.8% versus 14.8%, respectively; P=0.73). Specimens for pathology analysis. The means of the Banff ci scores from all of the biopsies (Bxs) at time 0 and 1, 4, and 12 months (mo) post-transplant were used for linear mixed model analysis of the slope of fibrosis, and paired Bxs at time 0 and 12 mo were used for the Δfibrosis paired Bx analysis. Percentages represent the percentages of each group with a Bx or pair of Bxs at that time point. DGF, delayed graft function. Details of the biopsy findings done at 1, 4, and 12 months post-transplant are shown in Table 3. The 12-month biopsies were available for 221 (64.4%) in the DGF group and 404 (68.4%) in the control group (P=0.22). The proportion of biopsies with Banff ci >1 was greater in the DGF group at 1 month but not at 4 and 12 months. On the 12-month biopsy, the fraction of biopsies with moderate to severe interstitial fibrosis and tubular atrophy was not higher in the DGF group (29.1% versus 26.0%, respectively; P=0.41). There were no significant differences in the acute Banff scores between the groups at any time point, except that there was more glomerulitis (Banff glomerulitis score) in the non-DGF group at 4 and 12 months (Table 3). In a multivariate logistic regression analysis of factors associated with moderate to severe fibrosis (Banff ci >1) on the 12-month biopsy, after adjusting for donor age, time 0 biopsy Banff ci >0, and the presence of tubulitis (Banff tubulitis >0) on the 4-month biopsy, DGF was not associated with an increased odds of moderate to severe fibrosis (OR, 1.07; 95% CI, 0.65 to 1.75) (Supplemental Table 4). CIT was not associated with increased risk for moderate to severe fibrosis on the 12-month biopsy (P=0.42). Next, we looked at the Δfibrosis for the paired biopsies at time 0 and 12 months. Paired biopsies were available in 155 (45.2%) in the DGF group and 283 (47.9%) in the control group (P=0.43). The distribution of the change in Banff ci score from time 0 to 12 months for all of the paired biopsies was the same for the DGF and control groups (P=0.91) (Figure 3). When the Δfibrosis was analyzed by era of transplantation, the Δfibrosis was the same for the DGF and non-DGF groups in the cohorts transplanted before 2012 (P=0.53) and after 2011 (P=0.33; data not shown). We also analyzed the DCD cohort separately. In the DCD cohort, the Δfibrosis was similar between the DGF and non-DGF groups (P=0.76; data not shown). We also analyzed the effect of length of DGF on Δfibrosis from 0 to 12 months. 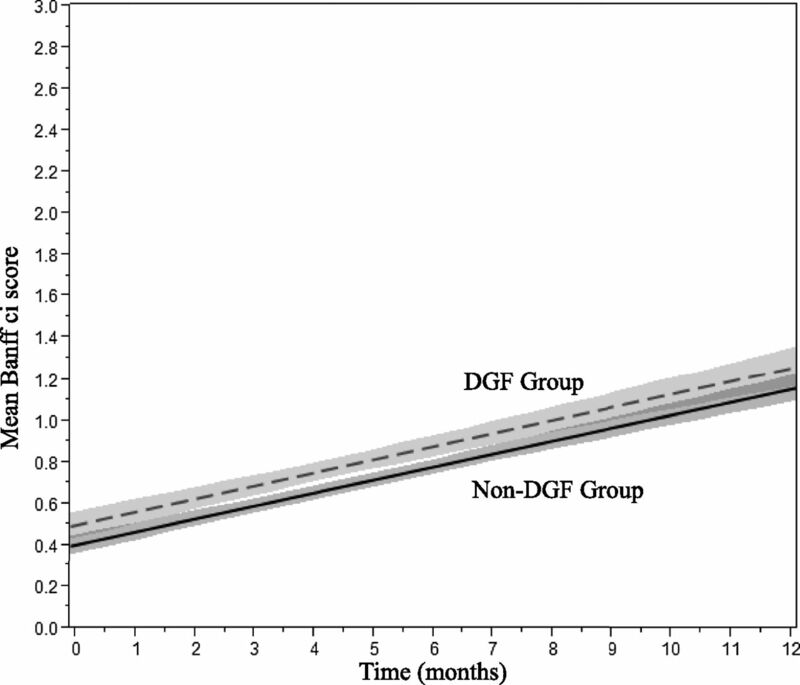 In this analysis, we divided the DGF into two groups: DGF requiring dialysis ≥9 or <9 days. There was no difference in the Δfibrosis between these two groups (P=0.85) (Supplemental Table 5). ΔFibrosis (Banff ci score) for paired biopsies done at time 0 and 12 months post-transplantation. The percentage of paired biopsies with the specific Δfibrosis result is represented by the height of each bar. The distribution of Δfibrosis as an ordinal categorical variable between the groups is not different (P=0.91). The numbers of biopsy pairs for each group are shown at the bottom. DGF, delayed graft function. Finally, we performed a linear mixed model analyzing the slopes for the progression of fibrosis (mean of all Banff ci scores) for all biopsies done at time 0 and 1, 4, and 12 months post-transplant for the DGF and non-DGF groups. The interaction factor for the slopes of progression of interstitial fibrosis during the first post–transplant year was not different (P=0.66) (Figure 4). We also looked the effect of the era of transplant on the progression of fibrosis. The increase in fibrosis during the first year was greater in the cohort transplanted before 2011 (P<0.001); however, the slope of the change was not significantly different between the DGF and non-DGF groups in either era (test for significance between progression of fibrosis and DGF; P=0.50). Progression of fibrosis during the first post–transplant year. Each line represents the linear model of the progression of the mean of the Banff ci scores (as a continuous variable on a scale from zero to three) for all biopsies done at time 0 and 1, 4, and 12 months post-transplant. The shaded area represents the 95% confidence interval of the mean line. A linear mixed model was used to analyze the differences in the slopes for the two groups. The hypothesis is determined by the test for significance of the interaction between the biopsy time point and the delayed graft function (DGF) grouping variable. We found that there is no significant difference in progress of fibrosis between those who have DGF and those who do not have DGF (P=0.66). ci, interstitial fibrosis. This is the first study to use data from serial protocol biopsies to analyze the effect of DGF on the progression of interstitial fibrosis during the first year after deceased donor kidney transplantation. Our analysis shows that DGF does not seem to accelerate the progression of fibrosis during the first year post-transplant. We used two separate analyses to support this conclusion: (1) we calculated the change in fibrosis by calculating the change in Banff ci score as an ordinal categorical variable between paired biopsies done at the time of reperfusion and 12 months post-transplant, and additionally, (2) we used a linear mixed model of the progression of fibrosis for all biopsies done at time 0 and 1, 4, and 12 months post-transplant. Both of these analyses support the conclusion that the rate of progression of the fibrosis was the same in the DGF and control groups. Our study along with others document a progression of fibrosis during the first year after transplant (25). However, our results suggest that DGF does not hasten this progression of fibrosis. Our results also provides evidence that the odds of DGF were higher among patients with donor-derived fibrosis, even after adjusting for other important DGF risk factors (OR, 1.70; 95% CI, 1.03 to 2.82). Evidence from previous studies has suggested that arteriolar hyalinosis on a preimplantation biopsy is associated with a greater risk of DGF (26–28); however, the value of preimplantation biopsy to predict transplant outcomes, including DGF or graft survival, is uncertain (29). The previous study by Cockfield et al. (26) also showed that interstitial fibrosis on reperfusion biopsy was not associated with the risk of DGF. DGF has been associated with inferior graft survival in some studies (18–20); however, others have not shown this (16,21). In our analysis, graft survival, including death with functioning graft, was lower in the DGF group. We found that the lower survival was entirely accounted for by the lower survival in the cohort transplanted before 2011. There are several possibly explanations for these findings. We excluded early graft losses, thus eliminating the effect of early technical–related graft loss, which is a different phenomenon from IRI. However, even in the earlier cohort, we could not find a difference in the rate of fibrosis progression. It is quite possible that kidneys more prone to DGF may simply have higher intrinsic risk (as noted from baseline biopsies) and may not have higher risk caused by IRI. In addition, our center has substantial experience with transplanting kidneys from donors with severe AKI, particularly during the later cohort transplanted after 2011 (17). As a result, our center accepts a disproportionate number of donor kidneys from outside our organ procurement organization. These donors have several demographic differences from the general deceased donor population. For example, the AKI donors are more likely to be men, black race, and brain-dead donors, and the donors were less likely to have died from cerebral vascular accident (17). It is feasible that the DGF that follows the transplantation of AKI donor kidneys may have a different outcome compared with the DGF in non–AKI donor kidneys; however, this difference will require further study. Studies in animal models have shown that IRI can activate both the innate and the adaptive immune systems (8,9,30). In addition, evidence from clinical studies suggests that DGF increases the risk of acute rejection (18,22). However, our results did not show an increased risk of rejection or subclinical inflammation in the DGF group. Previous studies have shown that rejection, including subclinical inflammation, increases the risk for progression of fibrosis (31,32). To account for a possible effect of subclinical inflammation on the progression of fibrosis, we used a multivariate model to adjust for tubulitis on the 4-month biopsy, which confirmed that DGF was not independently associated with greater odds of moderate to severe fibrosis on the 12-month biopsy. The previous studies showing a higher risk of rejection with DGF are largely from an earlier time period, whereas this study used modern immunosuppression, including uniform induction therapy. In addition, our protocol includes starting tacrolimus on post-transplant day 1 or 2 and obtaining a therapeutic level quickly, regardless of renal function or urine output. This approach may also account for the difference from previous studies. There are a variety of definitions of DGF used in the literature, but the most widely used definition is the need for dialysis within the first 7 days post-transplant (20,33). AKI in the nontransplant setting has been associated with an increased risk of developing CKD and ESRD (34–36). The mechanism of this transition from AKI to CKD is hypothesized to be related to the abnormal healing response, which may involve several cell types, including tubular epithelial cells, fibroblasts, pericytes, myofibroblasts, fibrocytes, and immune cells (37,38). In the transplant kidney, there are several other potential etiologies for graft fibrosis other than IRI, including both alloimmune response and nonimmune factors (e.g., drug toxicities, infections, and obstructive uropathy) (25,32,39,40). Subclinical levels of inflammation assumed to be related to an alloimmune response has been correlated with the progression of graft fibrosis (32). In this study, there was no difference in the incidence of rejection during this first post–transplant year. Given this, we would suggest that these findings may have broader implications than simply DGF and offer the first serial histologic assessment of AKI and progression of fibrosis. These findings will have to be, of course, validated in other settings but offer a unique vantage for this important discussion. There are several weaknesses of this study. This is a retrospective study design; however, there are no systematic and nonrandom biases likely in regards to those having protocol biopsies. We do not have data on the warm ischemia time, which may contribute to the process of graft fibrosis. Although a single pathologist did not retrospectively review the biopsies in this study, multiple pathologists who routinely examine renal allograft specimens read them, and the Banff scores were assigned prospectively. Furthermore, over time, the same group of pathologists read both the DGF and the control biopsies, and thus, a systematic nonrandom bias in the Banff scoring is highly unlikely. We acknowledge that the Banff ci score is a semiquantitative and categorical variable and not a linear measurement; however, it has an ordinal relationship with the quantity of interstitial fibrosis. As a result, converting it to linear scale still maintains this relationship. For the analysis of Δfibrosis between paired biopsies done at time 0 and 12 months, we used Banff ci score as an ordinal categorical variable, which supported the same conclusion by showing nearly identical distribution of change in Banff ci scores between the groups. The strengths of this study include a large cohort of patients with detailed pathology data from serial protocol biopsies and multiple statistical analyses supporting the same conclusion. We conclude that the presence of donor fibrosis in the renal allograft may increase the risk for DGF; however, DGF (IRI) does not seem to increase the progression of fibrosis during the first post–transplant year, and it does not seem to adversely affect graft survival. See related editorial, “Progression of Interstitial Fibrosis in Kidney Transplantation,” on pages 2110–2112. This article contains supplemental material online at http://cjasn.asnjournals.org/lookup/suppl/doi:10.2215/CJN.05060516/-/DCSupplemental.